Delicious, moist muffins that are perfect to make at the beginning of the week and enjoy each day as your grab-n-go breakfast! Blend muffin ingredients and pour into a greased muffin tin. Place into a preheated 350F oven and bake for 20 mins. 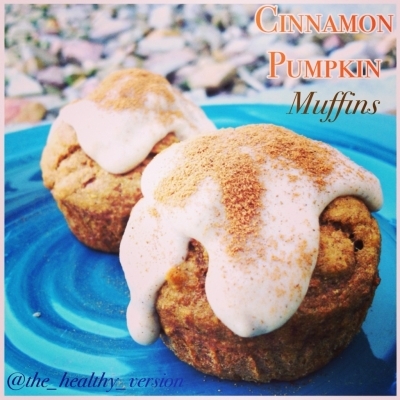 Icing is optional, but is just almond milk and vanilla protein powder, and pumpkin spice mixed together until it creates a thin, but not watery, mixture and poured on top with more cinnamon sprinkled on top.